On a gastronomic, relaxed and modern way you'll get involved with the magic feeling of a calm life. Chef Tom Boere achieves continuous high quality during lunch and dinner. The dishes are full of craftmanship, creativity and dare. It all comes together in Otium. What a discovery! Made a spontanous reservation for two on a Friday night. Ordered a 3-course menu. Staff was extremely friendly and helpful. Moreover they clearly were well experienced, as well as able to advise on food/wine choices. Quality and presentation of dishes was sublime. Fresh flavours, beautiful colours and carefully selected details (garnishes/flowers/cress) to finish each plate. Portions I consider to be ‘average’. Had a great evening at this location, big thanks to Angieszka & Hans. Is really a nice restuarent to b! Service very good! Real Friendly! I like the place! Thank you for your kind words! Will we see you again soon? I hope so! We went on a Saturday for lunch, place was empty, service was poor, food options for the 2 course menu were not sufficient and prices on the regular menu were absolutely outrageous. We were not impressed. Thank you for your feedback. What a pity to hear you did not have the evening you expected from us. The prices at the schiphol area are a bit higher than the average of The Netherlands, I ask for your understanding here. I will pass on your feedback in regard to the menu and the service to my colleagues. I hope you will reconsider coming once again, I promise we will make it up to you! When we first stayed at the Radisson Blu Hotel Amsterdam Schiphol Airport in 2014 for a 2 days Board meeting we were astounded by the quality of the food and service provided at Otium Lounge & Restaurant. 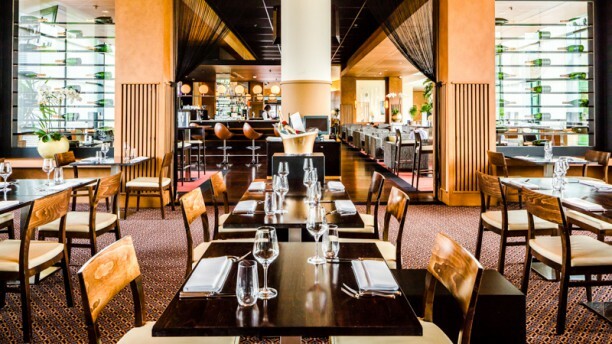 Returning to the Radisson Blu again in December 2015 we booked lunch at Otium. To say it was one of the best meals I have eaten is a bold statement but I can confirm this is true. The new ambience and design of the restaurant is world class. Our food was perfectly cooked and the wine advise was excellent to compliment the food. I can't recommend Otium enough. All I can say is that if you appreciate extremely good food and wine you have to dine at Otium, trust me you will not be disappointed. I look forward to have lunch and/or diner their again when we return to the Radisson Blu. Keep it up!